Betty X Davis inspired the Austin SCBWI conference crowd. In 2013 Austin SCBWI created the Betty X Davis Young Writers of Merit Award to honor Betty and one of her greatest passions: to support and develop a love for the written word within a child. We thought it only fitting that we interview this Austin SCBWI legend, and find out more about the woman behind the award. Where did you grow up and how has it shaped your writing? Akron, Ohio in the 20’s and 30’s was hardly an inspiration. Almost all the rubber tires in the world were made there. We breathed the unforgettable aroma of rubber, and in the winter, cold wind shwooshed down from Lake Erie. For most of the 30’s, the Depression overwhelmed us. Its ravages color my writing, yes, but no major influence. Betty, still faithfully playing tennis once a week. Did you always want to be a writer, and how long have you been writing? I never considered being a writer. No one we knew was a writer. Some teacher asked me (maybe I was in kindergarten), “What do you want to be when you grow up?” I said right off, “Just a plain old housewife like Mother.” I did necessary writing in school, even college, and got good grades. I’ve always been a great letter writer. A cousin even found one of my letters in a treasured box of Test family archives. I began serious writing in the late 70’s and 80’s when I was teaching (a speech therapist) and needed a curriculum. It doesn't surprise me a bit that when you found curriculum lacking, you just wrote your own! I envy your energy and spirit. If someone followed you around for 24 hours, what would they see? They’d be bored and I’d be embarrassed. I do cook good meals for myself. I spend a lot of time on the computer. Very little watching TV. I read a lot. Once a week I play tennis. (badly these days). I play Scrabble with myself; it’s always a close match. I'll have to challenge you in Scrabble! How does your everyday life feed your writing? Well, I reminisce a lot. Now I’m writing a biography of a remarkable aunt of mine. I wrote an MG novel about tennis in 1963. Soon I will write How It Feels To Be 100. 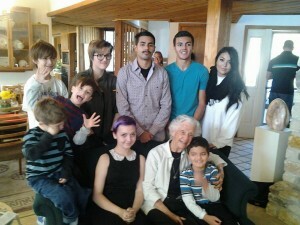 Betty with nine of her eleven great grandchildren. What accomplishments have made you proud? That’s easy! Having eight children, each one a delight! Oh yes, and I once played a witch in a college production of Macbeth. Same as you have, Meredith: when 4 or 5 of us started SCBWI around your glass top dining table — and just look at us now! Ahhh, Betty. I don’t remember what stories I was working on back then, but I remember the table and the people around it, encouraging each other. Tell me, what inspires you? My blessings, I guess. And an urge to see something of mine in print. Even a letter-to-the editor or an email to a friend. And being part of a writing community. In Akron, Ohio, on Thanksgiving Day 1915, Elizabeth Test was born, later known as Betty X Davis. She recalls Armistice Day after World War 1, the funeral train of Warren Harding, Lindberg’s pioneer flight, the death of Calvin Coolidge’s son, the Stock Market Crash of ’29, and the heartbreaking Great Depression. Never called Elizabeth, she had been plain Betty Test (nine letters, four t’s) until age eleven when she chose Xenophon for the missing middle name. 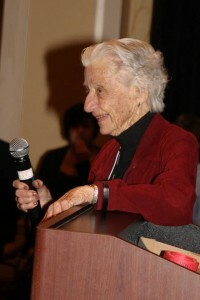 Finishing high school in Akron at 16, she entered the University of Akron, then transferred to Rollins College, graduating in the class of 1936, as Betty Xenophon Test. 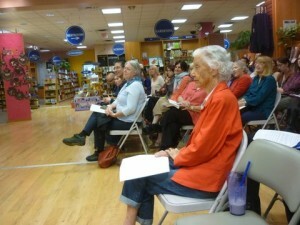 Betty on the front row at one of our monthly Austin SCBWI meetings. Married in Dallas, Texas in 1937, to Harvey L. Davis, a law student at SMU, Betty worked part-time, had their first child, and they all became Texans. After graduating, Harvey went into the FBI where he stayed all the war years. He then returned to Dallas, living there for almost forty years and raised their eight children (the last of whom was born when Betty was 46 years old). Most of those years Harvey taught at the Law School while Betty led Brownie groups, did Church work, sewed, earned two Master Degrees and became a Speech Therapist in public schools. 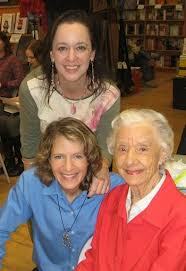 Retiring to Austin in 1982, Harvey joined a law firm and Betty wrote a curriculum for speech therapists. And they played tennis, the whole family played. Two children were Texas State champions and nationally ranked. Three of the boys played on college teams. One daughter won a National Senior’s title in her sixties. Tennis permeated their lives for seventy years. Harvey died at ninety-five after sixty-nine years of marriage. 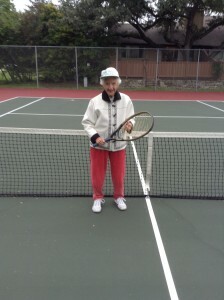 At age ninety-eight Betty still plays tennis, but at a very slow pace. Her passion is writing: rhymes, picture books, chapter books, letters. She has a driver’s license and looks always to the future.